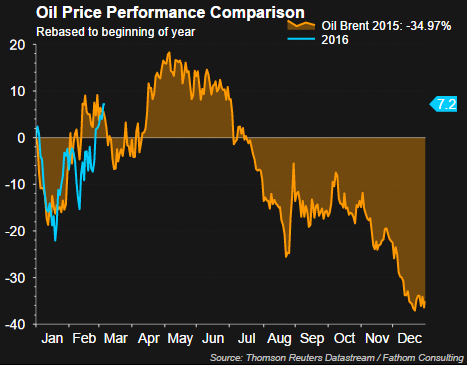 Oil prices in the first quarter of this year have turned higher, much like the pattern at the beginning of 2015. Since mid February the price of Brent Crude has increased nearly 40%, climbing from the high $20/bbl level to the high $30/bbl level. Friday's Commitment of Traders Report (COTR) released by the Commodity Futures Trading Commission (CFTC) noted money managers increased bullish bets on oil to the highest level since November. 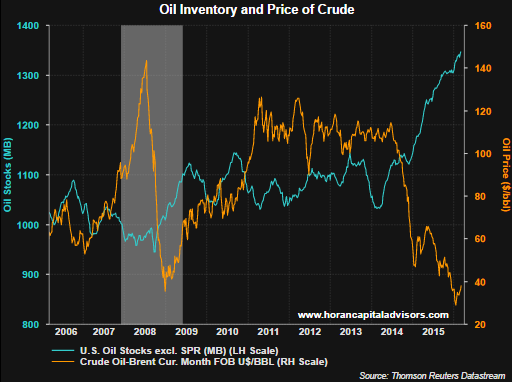 This increased bet on higher oil prices has occurred in spite of a higher than expected increase in oil inventory. The EIA Petroleum Status Report saw crude inventories rise 10.4 million barrels to a record 518 million barrels of oil inventory. The EIA report noted gasoline inventory declined 1.5 million barrels as demand for gasoline increased a strong 6.9% on a year over year basis. The oil inventory in the below chart includes not only crude oil, but gasoline, distillate fuel oil and all other oil related inventory. "U.S. oil prices rose to the highest since late January and Brent jumped to their highest since early January on Tuesday amid hopes that top global producers will agree a coordinated output freeze. That helped to offset growing concerns about the record U.S. inventory. "U.S. crude futures ended the week 10 percent higher after settling 4 percent higher at $35.92 a barrel on Friday as strong U.S. jobs data spurred hopes of better demand growth and on technical buying after crude prices breached resistance levels on charts. "The price action was impressive this week. Especially getting through $35 a barrel," said John Kilduff, partner at Again Capital, a New York energy hedge fund." It appears speculators are counting on production cuts by OPEC and Russia. If these cuts do not materialize, the oil price pattern detailed in the first chart above could result in oil prices falling back below the $30/bbl level as too much supply seems to be the main driver of the recent volatility in oil prices.